The title of this post is a little misleading, because while Pink Puddles is the latest crochet swap I joined, I’m not actually swapping any squares. I joined in the crochet swap as a CAL (crochet along-er), because I’m fairly certain with the little one on the way, that I won’t be on time getting my squares finished and sent out. But because I loved the color scheme so much, I’m still sort of joining in. Just from the side. We know that we’re having a girl, due to all of the extra testing we had to have done earlier this year, so when I saw the color schemes for the fall crochet swaps on the Vanna’s Choice Fan Club on Ravelry, I fell in love with two of the color schemes (the other of which I’ll write about later). But my number one favorite was Pink Puddles, which is a beautiful, gray scheme offset by a touch of pink. Perfect, I thought, for a baby girl. So on deciding what squares to use for patterns to start off this blanket, I decided to join in on the Moogly Crochet-Along. The squares are not as complicated as many of the ones selected for the BAMCAL, and it felt like a relaxing way to enjoy the colors, make some progress, and try out some new patterns. And so that’s where I’ve started. (Ravelry group for Moogly CAL is here). 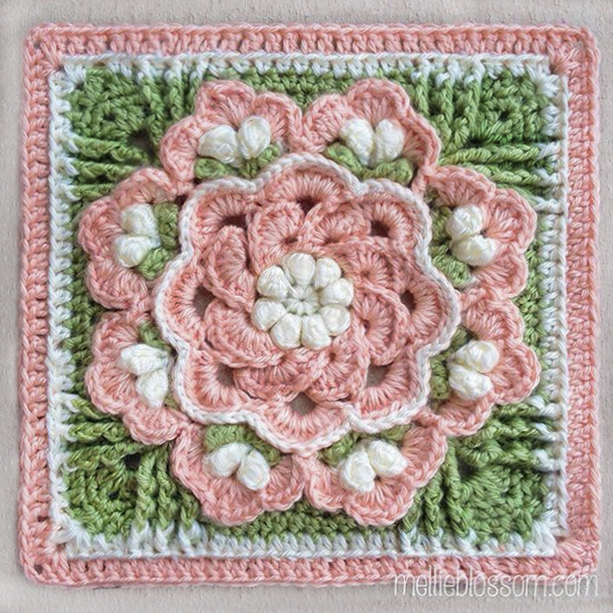 First is the 3D Flower Granny Square by Sarah Zimmerman (link to free pattern here). I altered this one up just a little bit by adding a little more variety to the ou ter rounds, and I’m really happy with the way it turned out. I’m not usually a fan of small motifs in squares, but the outer rounds really accentuate the simple, yet pretty flower in the center. And the 3D effect is just as subtle, fulfilling the depth factor without obnoxiously bursting out of the center of the square. You can just barely see the little charcoal leaves underneath the flower when you view it from the side, and that adds a little bit of nuance to the square as well. I enjoyed making it, and I like how it turned out. 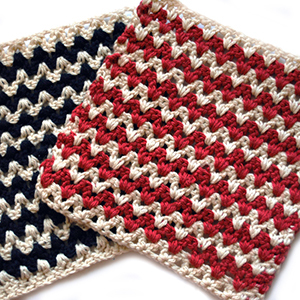 The second square I’ve finished for this crochet swap is the Winter Bloom Afghan Square (link to free pattern here). This is another one of those that I wasn’t sure how it would turn out, and ended up being very pleasantly surprised. I’m also really enjoying the neutral palette being offset by the slightest bits of pink here and there. I think this is going to end up a very lovely blanket for my new little baby girl! I have plenty more squares to make in this color scheme, but I’m going at a relaxing pace. Still, I’m excited to make some progress on this. More to come!